Synopsis: Late one night in turn of the 20th century Baltimore, a lunatic named Jason Cravatt (Patrick O'Neal) forces a minister at gunpoint to perform a marriage ceremony. We quickly discover that the bride is a corpse, her glassy eyes open, and as soon as Cravatt has tied the knot, he takes the woman's body away, lovingly placing a wedding band on her finger. The police, having lost the trail, turn to the proprietors of a wax museum dedicated to chronicling the most lurid murders in history. Anthony Draco (Cesare Danova) and Harold Blount (Wilfrid Hyde-White) are regarded as experts on the criminal mind, and they act as consulting detectives on the case. But can they guess the killer's next move in time to save his next victim? Comments: Before we dive into this cinematic oddity, I need to make a small confession. I don't always have 100% confidence that the movie listed in the newspaper is the same movie that was broadcast on Horror Incorporated. Last-minute substitutions were always a possibility, and without any actual records from the television station itself there's no way for me to independently verify what was broadcast. Fortunately for us, out-and-out substitutions occurred very infrequently and we can be fairly certain that a movie called Chamber of Horrors played on the night of Saturday, May 27, 1972. 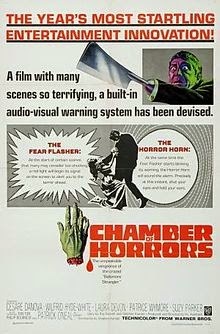 The problem is that there are a number of movies with the title Chamber of Horrors; and the TV station itself didn't write the description that appeared in the newspaper. Newspapers in those days (and even these days, I suppose) subscribed to a TV listing service. These services gave one-sentence descriptions of movies and TV episodes that newspapers could plug in to their daily schedule. It's a system that works pretty well, assuming the description you have at hand is for the right movie. But if Horror Incorporated played the 1940 movie with that title, or the 1962 movie with that title (as they did previously), we will never know. So, with that caveat, let's take a look at this particular Chamber of Horrors. It was directed by Hy Averback, a producer who worked mostly in television and who went on to have a very successful career with shows like F Troop and M*A*S*H. This film was originally conceived as a pilot for a TV series called House of Wax. Draco and Blount were the ostensible leads, using their encyclopedic knowledge of the history of crime to solve the bizarre murders that baffled the Baltimore Police Department. Most pilots, of course, never get picked up as series, and this was no exception. Though quite tame by today's standards it was probably considered a bit too ghoulish for network TV of the time. It's clear that some additional scenes were shot to pad the running time (Tony Curtis, a big star of the 1950s who was scraping bottom by the middle of the next decade, appears in a pointless cameo), thus making the film suitable for theatrical release. 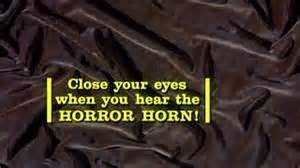 Also added was a zany, William Castle-esque gimmick -- the "fear flash" and the "horror horn". This was breathlessly promoted as an aid to the more nervous members of the audience -- when the screen began flashing red and the horror horn started honking, faint-of-heart viewers were encouraged to look away because something really, really, gruesome was about to happen. The problem with the gimmick is that nothing gruesome is ever shown on screen. For example, the screen starts flashing red and the repetitive tone starts bonging before Cravatt hacks off his own hand in order to escape. But all we see is a closeup of Cravatt's deranged face as he does the deed, and no actual blood or viscera is shown. Hammer films were a whole lot bloodier, and they were in theaters a decade before Chamber of Horrors. But we should make allowances. This was originally shot for network TV, and in 1966 the networks still held strongly to the idea that when someone turned on a television, they were inviting a guest into their home; and presumably guests aren't supposed to use foul language or start spurting blood all over the place. The cast is interesting, if not uniformly solid. 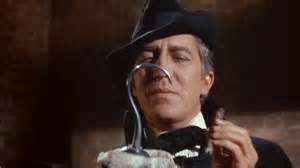 Patrick O'Neal seems to be enjoying himself as Cravatt, and Wilford Hyde-White's Blount is very reminiscent of a Hammer films character, as is Cesare Danova's Draco. Somewhat weaker is Wayne Rogers as a Baltimore detective, and the other characters are rather flat and forgettable. It's all rather messy as a feature film, and we can't fault the TV networks for passing on it. All the same, the overall look is quite impressive. 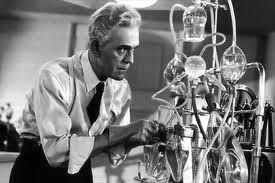 Synopsis: Dr. Henryk Savaard (Boris Karloff) is a brilliant doctor as well as a great humanitarian. He has designed a machine that will keep the blood circulating in a patient's body even when the heart has stopped. This is used in tandem with a coffin-like chamber that chills the body. With the body thus in a state of suspended animation, doctors can operate on a patient at their leisure. With the assistance of his friend Dr. Lang (Byron Foulger), Savaard enlists his lab assistant Bob (Stanley Brown) to test the machine. Their plan is to stop Bob's heart, use the machine to circulate his blood for a time, then restore him to life. But the police burst in during the experiment. Finding Bob's heart not beating, the coroner declares him dead and Savaard is arrested for murder. Comments: The Man They Could Not Hang was one of a number of mad scientist pictures starring Boris Karloff that Columbia made between 1939 and 1940. They were formulaic movies, and perhaps the most remarkable thing about them is how similar they are to one another. 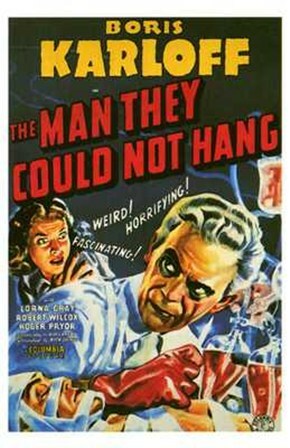 In each of these films, Boris Karloff played a kindly scientist whose important research is upended by a pack of paternalistic busybodies; as a result his line of research is ruined and he decides to take revenge on the parochial ninnies who thwarted him. In this picture, the police intrude on an experiment in suspended animation. The cops think the test subject (Savaard's own lab assistant Bob) is dead, and they remove him from the cryogenic tank. This results in Bob's actual death, for which Dr. Savaard is put on trial. 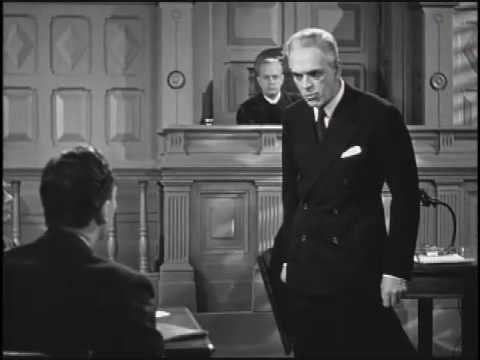 Embittered, Savaard swears vengeance against the judge, jury and prosecutor who rule against him. We can infer that the decision to make Bob the fiancee of Dr. Savaard's daughter Janet is designed to up the emotional ante, to make his death more of a blow to Dr. Savaard personally. But this decision is undercut somewhat by Dr. Savaard's use of Bob as the test subject in the first place. For all his confidence in the procedure, Savaard had to know that something could have gone wrong; and in fact something did go wrong. He might choose to blame the meddling police and the small-minded doctors who pronounced Bob dead in the cryogenic chamber, but Savaard still bears some measure of responsibility. But we need to go easy on the screenwriters here, because they have a pretty difficult task placed before them. Kindly humanitarians aren't easily turned into stone-cold killers out for revenge --- especially when the targets are guilty not of malice, but simple ignorance. The best revenge stories put their heroes through Job-like punishments and when the victims finally decide to launch their vendetta we are right with them. We root for Edmond Dantes in The Count of Monte Cristo not because we're into payback, but because he has been so cruelly and thoroughly betrayed that we want the injustice to be righted and the perpetrators to be punished. In The Man They Could Not Hang we are supposed to buy into Dr. Savaard's anger just enough to believe that he feels payback is warranted. At the same time, we're also supposed to understand that what he is doing is wrong and hope that he doesn't succeed. Any movie built on such a wobbly foundation isn't going to be entirely successful. But to its credit, the movie runs it by us so quickly that we don't have a lot of time to think about it.